Deciding between car paint colors can be a daunting task for the casual car or bike owner trying to choose that perfect color for their ride. There are literally more than 60,000 auto paint colors available on the market and at some point each of those colors was considered to be an “in” color. It’s easy enough to recognize a color you like. In fact, it’s often easy to recognize LOTS of colors you like. Narrowing down the pool of colors to make a final choice can be challenging. Adding to considerations are types of paint colors that you may have heard about from friends, and colleagues. While we may not be a able to review thousands of colors for you, we can share our knowledge on the various classes of colors and give some features of each and things to consider which might make your selection process easier and more effective. We’ve also included images of our popular colors by segment which can be clicked on to link you to those color options in our store where you can see pricing or complete your order. We have many more colors to choose from than those listed below so don’t hesitate to hop over the online store and cruise through all the selections. Metallic car paint colors are colors which have a sparkle to them originating from a finely ground metallic aluminum pigment. This metallic pigment gives paints a sparkle with numerous variations in sparkle size and and brightness based on the type of metallic pigment used. Combining these metallic pigments with a wide range of transparent pigments yields thousands of distinctly different car paint colors. From an application standpoint metallic paints can range from very easy to apply to more challenging depending on the color chosen. As a general rule, lighter colored metallic paints are more difficult to apply evenly than darker ones. Relatively speaking durability of metallic paints is good to excellent depending on the system used and color. Metallic paints are often confused with metal flake paint which is a very different type of sparkling paint color which will be discussed later in more detail. To learn more about metallic paints visit our metallic paints page over here. To see these in person purchase a hand sprayed chart in the color selectors area in the online store. Pearl Paint Colors with colored shimmers are made by combining special pigments called pearlescent pigments with traditional transparent pigments. Unlike metallic colors whose sparkle is based on a silver aluminum platelet, pearls are available in a wide range of sparkle colors and sizes. As such, pearl colors are said to have more “color depth” than the average car paint color. Pearl colors can be 2 stage where a pearl base color is applied then cleared or a 3 stage system where a solid base color is applied, then a pearl midcoat, and a protective clearcoat. Lighter colored pearl car paint colors tend to be more transparent than lighter colored metallic shades and as such many pearl car colors require a uniform color underneath since the lighter pearl color is likely not to hide color differences beneath. In fact many light colored pearl colors such as white pearls require a specific base color underneath making them a true 3 stage color. On the contrast, darker and medium shades are well suited for 2 stage applications and often will cover or hide the surface beneath well. From an application stand point 2 stage pearls are comparable to their metallic counterparts in ease of application but 3 stage pearls are often more challenging due to the transparent nature of the pearl midcoat. The durability of pearl finishes is generally comparable to that of metallics colors. To learn more about pearl colors visit our pearl colors page in the colors menu above. Solid car paint colors are those which do not contain a sparkling agent such as a pearl or metallic. Black and white are the most popular examples of solid colors but there are literally thousands of other identifiable shades. Solid colors are generally easier to apply than pearls or metallics since there are no sparkling agents to worry about orienting evenly. Many of hte most popular classic colors of all time fit into the solid color category. Solid colors are generally better than average in terms of durability when used in a quality base clear system. To see the actual colors, purchase one of our hand sprayed color charts in the color selectors area in the store by clicking here. Candy colors have unmatched “depth of color”. These car paint colors offer unique looks due to a unique process to make a true candy effect. Candy colors are made in a 3 step process where a sparkling basecoat is used and then a transparent colored midcoat, the candy coat, is applied and finally protected with a high gloss urethane clear. This process creates a sparkling color where the sparkle appears to be immersed in the color. 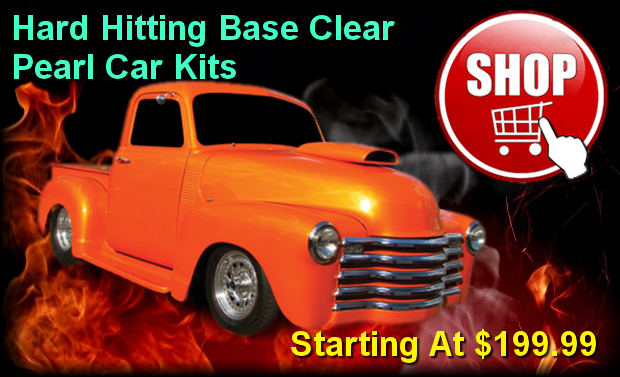 Candy colors are often referred to as “wet” due to the deep wet shine often obtained. A couple of draw backs to true candy paints are that they are more difficult to apply and the durability can be substantially less than those of solid, pearl, or metallic finishes. To learn more about candy paints and see our candy offerings visit our candy paint page. Color changing paints have the ability to display radically different colors depending on how or where they are viewed. The most common type of color changing paints are “chameleon paints” that change color based on changes in the viewing angle. Often 3-5 distinctly different colors can be viewed on one object from one paint. These colors offer maximum viewing impact for those that want a ride that really stands out. The biggest drawback to this type finish is they are among the most difficult to apply evenly. 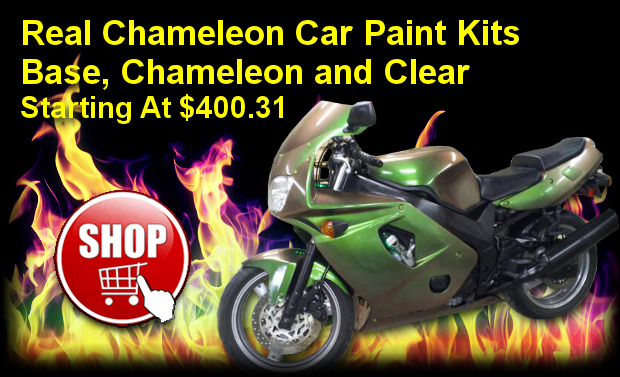 Durability with chameleon paints are fair to good compared to conventional automotive finishes. 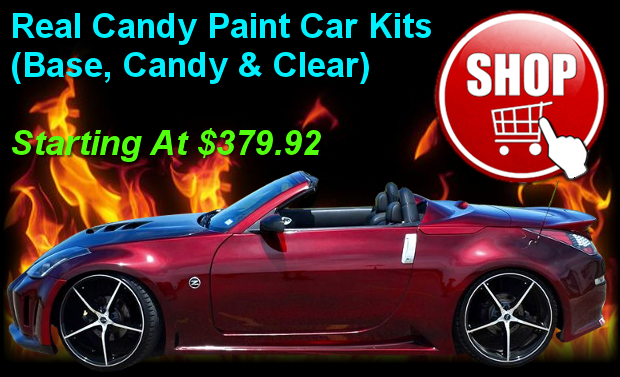 Let us first break down car paint colors down into two general categories; custom paints and factory paints. Factory paints or Original Equipment Manufactur (OEM) colors are those in which are used in the production of commercial vehicles being manufactured in mass quantities. Essentially, these are the paints that are being applied to assembly produced vehicles by brands such as Ford, GM, Chrysler etc. Custom car paints are basically those that are not factory paints. Generally speaking custom paints are made to be unique when compared to factory paints of the era. 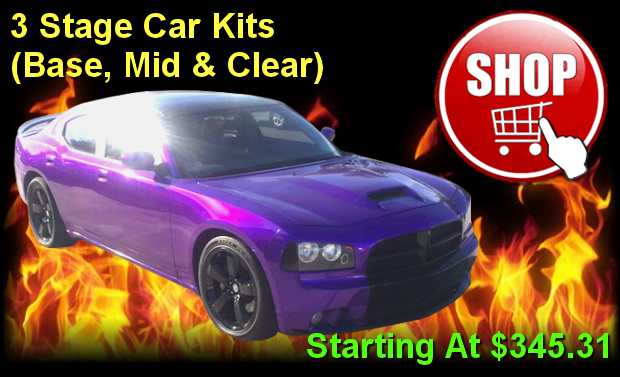 There is a strong market of car and bike owners looking for colors the stand out and custom paints fill that need. 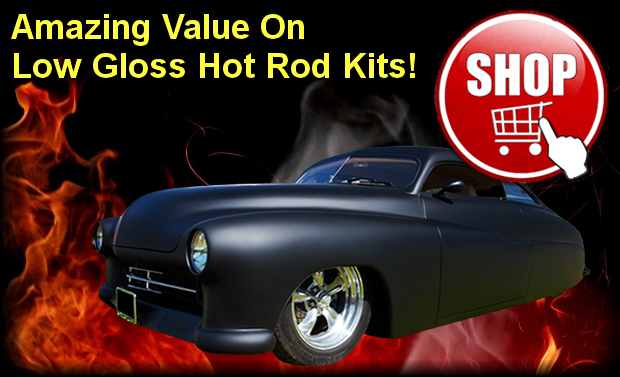 Custom car paints range from “loud and proud” to subtle and sleek to fit a wide range of tastes. While custom paints may not be as easily attainable as factory paints, they are readily available and worth the effort if you are looking for a unique finish. 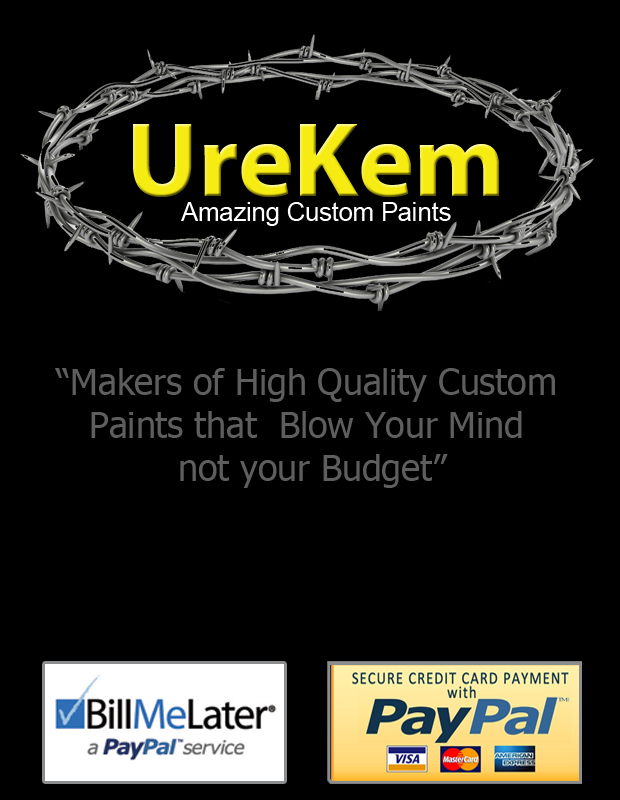 Whether custom paints or factory paints there are numerous categories of paints as discussed above.